Granite countertops – they have stood the test of time as America’s favorite countertop surface for many years. But how does granite “age” ? Of course we know that the stone surface is “hard as a rock”, but did you know that your granite does require periodic maintenance to remain both beautiful and durable? Yes, granite countertop seal and restoration work is an important follow up service for your granite countertops. Even though they are stone, they are not immune to damage if they are not properly maintained. 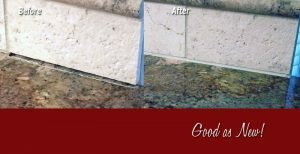 The sealant that was originally applied when your granite was installed will eventually wear off, which leaves your granite more susceptible to stains and chips. Showcase Design’s granite countertop seal, repair and restoration services focus on restoring your granite to its original beauty and protecting it from future damage. A sharp object or heavy high-impact blow. Since granite is a crystalline surface, it will chip with a hard enough blow. And don’t forget – you STILL have to use a cutting board to chop vegetables! 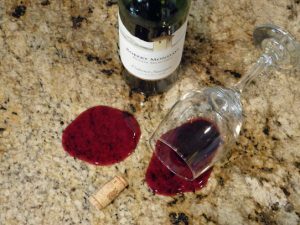 Your granite should never be a substitute for a cutting board. Improper cleaning materials. Granite should be cleaned only with water (you can use very mild soap if you wish), and then wiped once a week with a damp cloth and a pH-neutral cleaner made especially for stone. Harsh household cleaners will scratch, etch and pit the surface of the stone, and erode the sealant! We do offer a fantastic Stone Cleaner, call us at 919-363-9908 for details. Non-evaporative liquids like oil. If you don’t wipe up a cooking oil spill within a few minutes, the oil will absorb into the stone and cause a stain. This can be a terrible shock if you have installed a beautiful light-colored granite such as Carrera Marble! Allowing the sealant to wear off. Sealant protects your granite and without it, more problems such as staining, pitting and chips are sure to occur. Luckily, we can repair most any minor damage caused to stone countertops – even oil stains and chips. 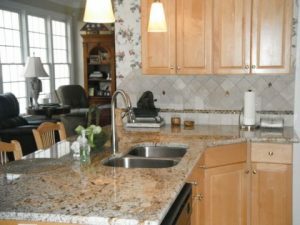 Once the granite is repaired, we then seal your granite countertop and provide you with proper granite care instructions to prevent future damage. Granite Repairs can be performed on most granite countertops or stone tile. In many cases you will not even see the finished repair if it was done by a industry professional. We are experts at perimeter grouting and caulking as well as seam repairs. We can work with you to match all colors exactly for a cosmetically perfect repair! Contact Showcase Design Kitchen and Bath Renovations today for granite countertop sealing and restoration services, by calling 919-363-9908.